Hello everyone. My name is Zee and I write romance. Lol, this is pretty much how I could sum myself up. Yes, romance, but that doesn't mean it's your wham-bam, boy-meets-girl-meets-difficulties-finds-resolution formula. It's a bit more complicated than that. For example, in my current WIP, boy has a heavy backstory that makes him distrustful, and girl is looking for her roots in a globalized and topsy-turvy world. What characterises this couple I'm currently writing about is the sometimes soft, sometimes harsh, tug and pull between them. Not just attraction, not just chemistry, not just love - theirs is much more realistic than that. Now last week on this same spot I talked about music and how I have used it in my previous novels. I promised that this week, I'd bring forward the song that is sticking as the love theme for this WIP. Have you ever listened to a song and it just haunts you? I got this album many years back - Savage Garden Greatest Hits. I love that group, and Darren Hayes, the lead singer, has a gorgeous voice (they've split now, and Hayes is pursuing a solo career). Their style was also very eclectic - yes, the same 'voice' (and I don't just mean the vocals here - you writers should know what I'm talking about! ), but the 'genres' were very varied. From love ballads such as Truly, Madly, Deeply and I Knew I Loved You, to electro sounds such as To The Moon & Back and I Want You, to hard beats like in Crash & Burn and Break Me Shake Me - I always elected to have this album with me as the one music disk I'd take if I'm to be stranded on a desert island. On the CD then I come across this song - Hold Me. Powerful lyrics - it always moves me and leaves me shaking to hear this strong man stepping down and confiding how much he needs this special woman to make him whole, just for a moment, even if everything around and between them was tearing itself apart. It struck me as something a real romance hero would say - not flowery, not ornate, just straight to the point. This man reckons he needs this woman, but he doesn't beg and grovel, just puts out the truth and lays it at her feet. The power is in her hands, too take him and make him whole again. The mention of the ring - that's a big part of my romantic conflict! I'm eager to hear what you think of the song! And those of you checking out the WIP so far, what do you make of the theme in relation to the story? I love this song. I have every album, single, dvd by Mr Hayes. I have also had the privilege of seeing him live in London. 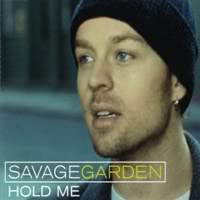 My fave song - Mine, from their firt album, Savage Garden. Definately the inspiration behinf Letting Go. Its funny how one song can set the mood for a whole novel. This song tells a great story. It's great when you can find the perfect song to represent the theme of a book. My mind tends to work in scenes as far as music goes. I'll hear songs for what's going on in a particular scene, so by the time I finish the book I have an entire soundtrack. In fact, I'm thinking about giving away CDs as part of the contests for my next book. As long as you don't sell them, it's legal. Viviane! Lo, girl. I think of you every single time I listen to Savage garden. I knew I had to let you know this song here was the inspiration behind the romantic conflict. I'll have to look for 'Mine'. I'm definitely a fan of this man! Great idea about the CDs. Amazing how music can drive our stories, and the one behind these lyrics always struck me as amazing. I usually have songs for scenes too but once in a while, I will come across that 'perfect' love theme song and be left reeling! This is a great story. It tells me that anyone can be vulnerable at times, even the strongest of people, and sometimes, those who are normally known as weaker or less aggressive are left to carry the torch and make things better. It's life. What a great message! It's a great message indeed! Strong, powerful, but totally relatable and 'real'.